Get a 2nd 8 Qt AirFryer for $50 Off! 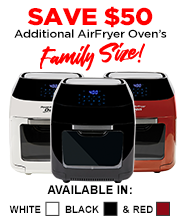 You can get a 2nd 8 Qt Power AirFryer Oven with all the same bonus items for $50 Off! Each additional 8 Qt AirFryer Oven is just $149.96 with FREE SHIPPING! 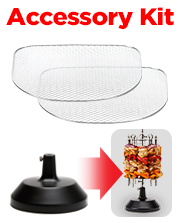 Maximize Your AirFryer's Abilities with the Accessory Kit! Our Accessory Kit includes the Rotisserie Carving Stand and two additional airflow mesh racks for just an additional $39.96 and enjoy FREE SHIPPING! The Carving Stand lets you easily carve your meat after it cooks in the Rotisserie. With two additional airflow mesh racks you can fit all 5 in your AirFryer Oven to maximize your cooking surface or prep a few trays while others are cooking! Select 'YES PLEASE' to add the Accessory Kit to your Power AirFryer Oven! 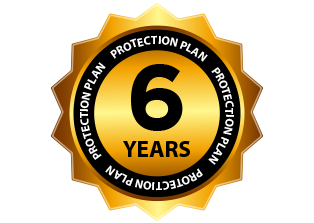 We know that life happens – whether accidents, power surges or general wear and tear – so we developed our 6-year Protection Plan that you can add to your order for just $29.96.